The Uyuni Bus station building is currently under construction. The building is located outside Uyuni town. There is no date set for the inauguration of the Uyuni Bus terminal, so all bus companies in Uyuni gather at a corner of the city. Travelers can find most of the Bus companies on the corner of Cabrera St. and Arce Av.. Buses arrive and depart from this spot. Generally the vehicles park in front of their offices. Uyuni buses offer a wide range of services, catering for different customer groups and market sectors. Prices vary according to the level of comfort offered. On one hand there are local buses that transport passengers in standard vehicles without heating or air conditioning, and on the other hand there are also Tourist Buses featuring comfortable bed seats, bathroom, heating and dinner during the ride. These types of buses generally operate long distance routes like La Paz - Uyuni - La Paz. Due to the lack of infrastructure there is no formal bus timetable. Travelers get bus tickets directly from the bus companies, although it is recommended to buy the tickets in advance to guarantee your seat. During the high season or festivities bus tickets are commonly sold out. Get your Uyuni bus tickets online through boliviatravelsite.com purchasing via PayPal! Request updates on the bus timetables and fares! There are daily Bus departures from Uyuni to La Paz. Buses leave Uyuni town from 16:00 to 20:00 hrs from their respective offices. The journey to La Paz takes from 10 and a half to 11 hours. Todo Turismo offers comfort to their passengers. Todo Turismo Buses have first aid kits, oxygen masks, air conditioning, central heating, individual air control, plenty of space between seats, 2 Color TVs, toilet with air extractor, pillows and blanket. Todo Turismo provides bus E-tickets with assigned seats to avoid issues of double ticketing. The Todo Turismo bus departs from the office in Uyuni at 20:00 hrs and arrives in La Paz city from 06:00 to 07:00. The travel time is between 10 to 11 hours. The Todo Turismo Office in Uyuni is located at Cabrera St., between Bolivar & Arce. See below a picture of Todo Turismo offices in Uyuni town. During the rainy season the Todo Turismo Bus departs earlier and the travel time will vary according to the weather and road conditions. For your reference, during the rainiest months (December to March) the Todo Turismo Bus departs from Uyuni to La Paz at 18:00 hrs. Make sure to be at their offices half an hour before and advise your tour operator to end your Uyuni Tour accordingly. The Todo Turismo Bus is generally delayed during the rainy season, so take your precautions and do not miss your Uyuni tour or connections. We recommend to book your Todo Turismo Bus tickets in advance. Especially during the high season the bus tickets are often sold out. Panasur Bus offers daily departures for the route Uyuni - La Paz. The Panasur Bus Company offers double floor buses equipped with 26 160 degree reclining bed seats on the first floor and semi-bed seats on the second level. Each bus has onboard TV which plays movies during the trip. The buses have individual reading lights, air conditioning, central heating and bathroom. The Panasur bus departs from Uyuni to La Paz at 20:00 hrs. Passengers should be at the Panasur office in Uyuni by 19:30. The Panasur office is located at Cabrera Street, almost at the corner with Arce Ave.
Panasur office in Uyuni town. During the rainy season Panasur buses change their route passing through Potosi and thus increasing the travel time significantly. The Panasur Bus Company does not provide E-tickets. Bus tickets are sold with confirmation vouchers and assigned seats. The Trans Omar Bus Company provides transportation for the route Uyuni - La Paz from Monday to Sunday. Trans Omar Buses are semi-bed type and feature TV and bathroom. The Trans Omar Bus Company also offers transportation from Uyuni to Cochabamba on Tuesdays and Fridays. Buses depart at 19:00 hrs from Trans Omar office in Uyuni and arrive in Cochabamba Bus Station at 7:00 a.m. 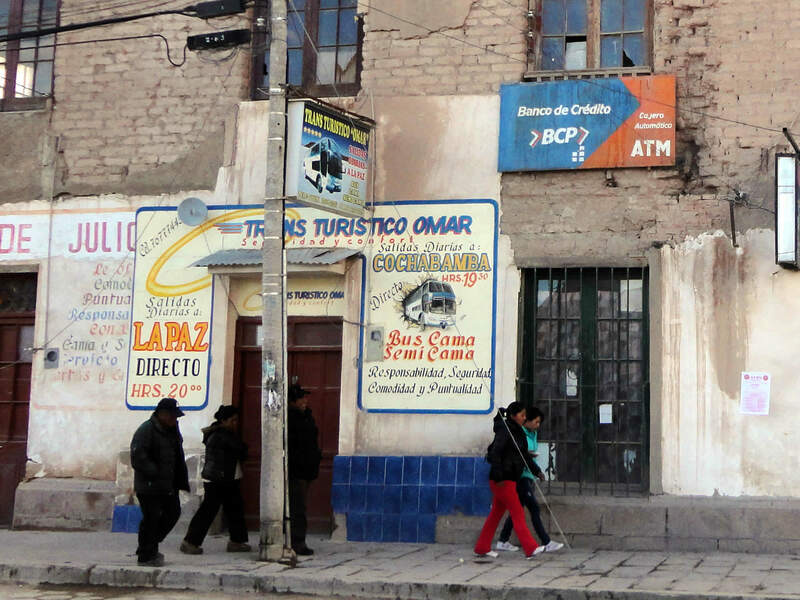 The Trans Omar office in Uyuni is located on Cabrera St. almost Arce Ave.
Find below a picture of Trans Omar office in Uyuni town. Travelers departing from Cochabamba to Uyuni can take Trans Omar every Wednesday and Saturday at 18:00 hrs. The Bus arrives to Trans Omar offices in Uyuni at 7:00 a.m. Bus Schedule: Uyuni - Sucre ( 381 km. paved road). There is no direct Bus from Uyuni to Sucre and they make a compulsory stop in Potosi. Buses leave from Uyuni to Sucre on daily basis. Most of the us companies depart from Cabrera street to Sucre at 9:00 and 10:00. The travel time is approximately 10 hours. The paved road is in a good condition and almost finished with only 3 kms still under construction. Todo Turismo used to offer this route, but at the moment the company has not confirmed from when they will restart operations. 6 de Octubre Bus is the only company that offers daily and direct transportation from Uyuni to Sucre at the moment. Buses leave Uyuni at 9:00 and 10:00 hrs. (Best to book this in advance). They journey time is around 10 hours. Buses from Uyuni to Potosi depart daily. Travelers can choose to take buses at 09:00, 10:00, 19:00 and 20:00 hrs. The travel time between Uyuni and Potosi is approximately 7 hours. Buses depart from Cabrera Street. The most popular bus companies are: Trans Diana, Turismo 11 de Julio, Trans Turismo 11 de Julio and Trans Emperador. Buses leave daily from Uyuni to Oruro. Buses depart from Cabrera St at : 06:00. The travel time is approximately 8 hours. The most popular Bus Companies are Trans Azul and 11 de Julio. Buses going from Uyuni to Tupiza depart at 06: 00. The travel time is approximately 7 to 8 hours. The most popular bus company is Boqueron Bus with daily departures to Tupiza. There are also daily 4WD services Uyuni to Tupiza. The travel time is from six to eight hours. Private transportation leaves around 10:30 am. Buses depart Mondays at 03:30 am, Thursdays and Sundays at 05:00. The passengers must change buses at the Chilean border and get on Chilean Buses that will take them to Calama. Bus companies: Centenario and 11 de Julio.